Another great project - Stealth Construction, Inc.
Hope everyone is enjoying the summer. This project has been a lot of fun and because we were able to design and build every aspect of this project. We started with the very quaint original house and a big dream. The original house was 1248 sq ft. and the new home will be about 2700 sq ft. with a spacious 2 car garage (33′ x33′). There were a few things that were a priority. The main points are to have an open concept main living area, master suite, finished basement with laun…dry room and a garage that could be for multiple uses. We also wanted to make sure we were as energy efficient as possible so there was a lot of thought and effort put into the design of all the systems in the home. 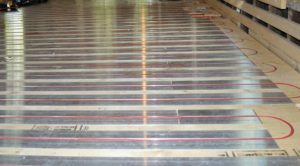 The first as you can see in the pictures is the use of radiant heating in the garage. 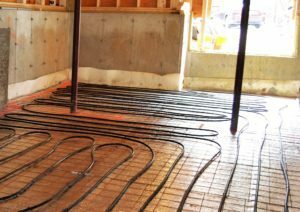 Radiant heat is a very efficient way to heat a space and a great way to warm your garage space. As I mentioned before the goal for the garage was that it could be used for multiple uses and the radiant will allow us to do that. Concrete is a large thermal mass. It can take a bit of time and a decent amount of energy to heat it up. The nice thing about this large mass is once it is warmed up, concrete retains that heat for an extended period of time. Now the entire concrete floor is a large radiator. This heats the air as well as any other objects in the room including your car. Really nice advantage in the winter to be able to get in the car and the car including the motor is already at room temperature which allows you to just turn the key and go. Another great advantage is the concrete is such a large amount of mass, a room can maintain its warmth even if a large amount of cold air is let in. Some factories use concrete radiant floor heat because they have to open and close large dock doors. Cold air will enter the building often, but the room will recoup that heat loss quickly. The large thermal mass of the concrete won’t change with a gust of cold air. © 2018, Stealth Construction, Inc. All Rights Reserved.